Just six games into the season, Auston Matthews has reached double digits in goals. 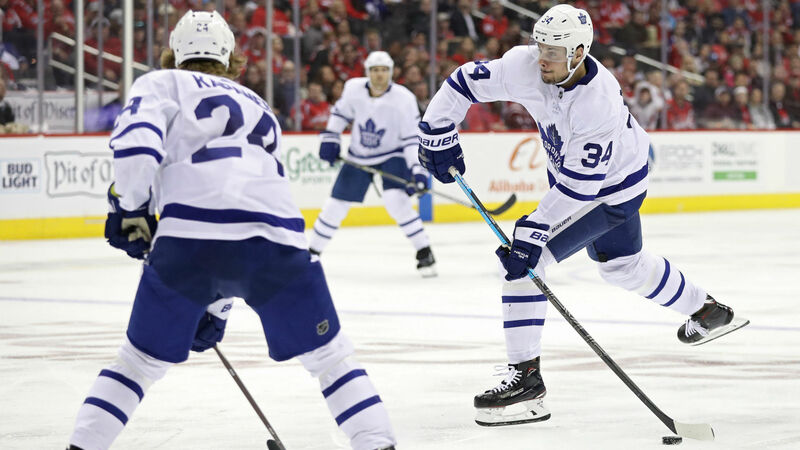 The Toronto Maple Leafs’ center notched his 10th goal of the season on Saturday in the team’s 4-2 win over the Washington Capitals. Matthews has registered at least one goal in each of Toronto games and at least two goals in four games. Matthews leads the league in both points (14) and goals (10). Lurking by the net, Matthews buried the tip-in attempt by Kasperi Kapanen and scored with just 1:39 left in the game, giving Toronto a 4-2 lead. Goaltender Frederik Andersen, as part of a 25-save night, made several key saves moments before Matthews’ insurance goal, allowing the Maples Leafs to seal their fifth win of the season. The 21-year-old joins Mario Lemieux (11 goals, 1988-89) as the only players in the past 30 years to register at least 10 goals in their teams’ first six contests. The Arizona native is the 15th player in NHL history to score at least 10 goals in his first six regular season games and just the fifth since 1943. Matthews is also adding his name to the Leafs record book. He is now the second player in the Leafs’ historic history to score in each of the teams first six games and joins Sweeney Shriner (1944-45) as the only players in Toronto history to register multiple points in the teams first six games. Thanks to Matthews’ outstanding start, the Maple Leafs lead the NHL in goals with 29 as their standout center has accounted for nearly one-third of them.